Easter Island, (Rapa Nui) Chile, is an extremely remote island and one of the world’s most famous yet least visited archaeological sites. It has perhaps more mystery and speculation in proportion to its size than any other prehistoric place on Earth — since about half of the 887 massive stone monuments remain unfinished in its main quarry. People have wondered why so many statues were left unfinished, when was the last one carved, and how were they transported in as early as 500 AD? 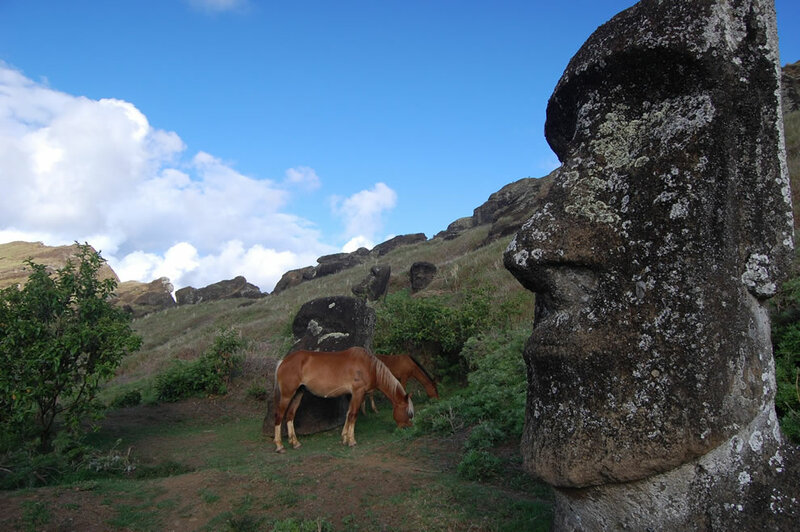 The Rano Raraku quarry at Easter Island is where the incredible ancient relics called moai were cut out of volcanic rock and sculpted prior to transport to various sites on the island. At least 288 of the monumentally massive moai once stood upon massive stone platforms called ahu. The moai dotted Easter Island, the paradise turned wasteland which serves as a cautionary tale and poster child for ecological disaster.